Featuring two restaurant areas, Oblix is inspired by the classic New York grill but also celebrates British and European influences and ingredients. 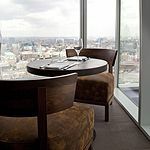 The Shard's Oblix also features a sommelier station where guests can be more involved in selecting their wine. Do you work at Oblix? What did you think of Oblix? Oblix is a cool place to while a way a few hours with some cocktails and the view. I didn't eat but almost wished I had as the food looked really appealing, it's a deli type lunch that's set out on the counter when you walk in. View of course is amazing, and we were lucky enough to grab a table by the window. The bartender was really sweet and got my friend to try her cocktail before he made as he was worried that the pineapple and Mezcal might be a bit too strong for her (clearly didn't know her! ;)) I had the Pear and blueberry cocktail and my friend also had a caramel and banana cocktail which was to.die.for. Worth a visit. The guys behind Zuma and Roka bring their brand of fashionable, destination dining to the Shard, this time trading in the fancy Japanese plates for a slice of the Big Apple. 32 floors up is a pretty good starting point for any restaurant. And whilst those hysterical defenders of the capital’s integrity might despair at the foreign investment in Renzo Piano’s creation (their understanding of the London landscape is perhaps a little blurry - modern life is rubbish, maybe? ), the Shard is certainly an impressive piece of design. And Oblix uses its lofty location well, with expansive views that look very cool by day and downright delightful when city lights roll and stab through the darkness. The (intended) delay in actually seeing the view comes from having to walk through a very busy kitchen to get to your table, which kind of works: it’s good to see the mechanics of it all but it doesn’t feel quite right - like seeing props being put into place before the curtain opens. Still, it’s a cracking dining room that doesn’t rely on the vista thanks to Claudio Silvestrin’s restrained but typically chic design. 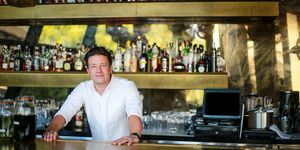 With Rainer Becker and Arjun Waney’s other London restaurants, Zuma and Roka, remaining so beloved by the trendy, moneyed lot, Oblix will no doubt be able to piggyback on that popularity for a little while. And whilst there is a certain aura of exclusivity, it does feel a little more accessible to the general punter, perhaps thanks to (slightly) less haughty pricing and the fact that the location in itself will attract celebration diners rather than simply those looking to be seen. There is a bit of professional detachment from some of the staff but most are just downright pleasant – not least the group's very charming head sommelier, Alessandro Marchesan, who looks a bit like Hugh Laurie (House, not George) and will probably go down a storm with slightly squiffy ladies lunching. Oh, a quick note to chaps looking to woo: if this place doesn’t work just give up, sorry. Moving from the fancy Japanese plates that have worked so well before to more international options with a US bent seems suited to somewhere that obviously has New York in mind. And while it feels like a pretty masculine menu (there’s a lot of steak and the rotisserie plays a big part) the food is lighter than you might think. Some lovely seared beef (£12) is a delicate little starter with a gentle lime, chilli, garlic and ginger dressing, and the lobster and scallop ceviche (£19.50) might be less refined than some in London (Lima, for example) but the quality is still high. There’s a generous amount of seafood, and the jalapeno, coriander and sweet pepper just about make themselves heard above a lot of lime. The rotisserie is something of a selling point, and the little birdies slowly spinning in their naked, dripping glory do look pretty appealing. The duck (£23) is superb, with perfectly cooked meat, less fat than you might imagine and some very good, slightly charred skin. The mango chutney isn’t the most nuanced, but it tastes pretty good and works every bit as well it should. A big slab of halibut (£28) is flaky, creamy perfection. Caper berries add a bit of salty bite but the Meyer lemon jam might be a little too much like curd for some tastes. Capers also make an astutely-judged appearance in a delicious roasted cauliflower side (£7), with roasted almonds offering nutty depth, while sweet carrots (£4) are cooked with orange and ginger, and are very good. Desserts are delicious. A strawberry and rhubarb pavlova (£8) is brilliantly light and refreshing, with a perfect meringue and enough fresh fruit to evoke a British summertime that doesn't really exist outside of the Darling Buds of May. A yoghurt cake (£8) is similarly impressive (and light) with notes of peach and lemongrass and some very good buttermilk ice cream (also available on its own). Dishes are designed to share, and seem well suited for that very purpose, so though prices are a little steep there’s no need to order three hefty courses per person. If you do want to have a bit of a spend up (and you get the impression a fair few will) you obviously can, though the very fast lift (ears will pop) might wreak havoc on tummies too full. As with the food, if you want to spend a small fortune you can – there are some superb wines here, sweeping steadily up to a 1993 Le Montrachet Burgundy at £3650. However, bottles start at a reasonable enough £24 (and you can even get a very good Tim Adams Fairfield Black Semillon for £28) and there are plenty in the twenties and the thirties. 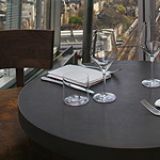 A few are advertised by the glass (a 2011 Condrieu Invitare Viognier from Domaine Chapoutier at £20 is exceptional, and a Billecart Salmon Rosé NV very good at £15.50) but apparently they’ll open any bottle for you, which is nice of them. One particular highlight on a pretty extensive global list is the Tuscan 2003 Vin Santo from Castello d’Albola (£85 per bottle), an exquisite dessert wine with bags of fruit and walnut – a great way to finish. This lofty spot might show that Waney and Becker still have one eye on the cool crowd but this is destination dining as it should be done. Good food, a great atmosphere and views head and shoulders above most. I was horrified to hear my sister had an allergic reaction at this restaurant despite warning the waiters about her nut allergy. After being incredibly ill, throwing up in the toilets the whole night and later complaining - the staff showed little sign of being apologetic, claimed it wasn't a nut allergy and offered no sign of any form of refund on the night. Clearly this place has little respect for their customers with dietary requirements, and even less customer service attention. I would definitively not recommend this place based on their poor response particularly given it's a luxury bar and promotes itself to having attention to detail. After asking for a refund, they said they could only refund 2 potential dishes they thought had nuts in, and after further complaining they blamed the issue on my sister not wanting a full refund. I think those in the customer service department need to pull their head out of their arse, and show a sign of empathy. We went to the lounge, it was without doubt the coolest place in London. Whilst we were there Jamie Cullum came in a gave an impromptu appearance, he stayed and played for over an hour. The views are spectacular, the food was good (we opted for a table full of starters which worked perfectly for us). The service was spot on, friendly without being intrusive. I have visited the Oblix lounge on two occasions now. Both visits were in the space of a couple of months of each other with two different groups of friends. On both occasions we were made to feel unwelcome and uncomfortable by most of the staff. We were looked down on and frowned upon even though there was no reason why they should have done. To be honest, the drinks are overpriced, there was no atmosphere, in fact, all the lounge has to offer is the view. That's the reason why I've given 1 star! Anyone visiting London and wants to see the sights, either pay a little bit more and go to The View at the top of the Shard or take a leisurely lunch cruise on board Bateaux London! Booked this for a friends surprise birthday dinner for 4 in June 2013, and it opened in May 2013. Was told we would have the table for 2 hours from 6-8pm. Turned up early and were shown to the bar to wait for our table, on entry views were amazing especially as it was sunny. Sat on the sofas sipping cocktails. Waitresses dressed very nicely, waiters very smart too. At 6.10 had to remind the staff that our table should be ready to which we were taken immediately, right by the window so we could see the view. Wasn't too busy at this time and we had a lovely waiter called who was attentive throughout our meal and who got a very nice tip ;-) We were told that the portions were big enough to share between two but they were actually enough for one person so we had to order more. Crab cakes were small but delicious and the mains were again more tastier than expected. The halibut was lovely as was the lobster especially since they already take the meat out of the shell for you. Desserts were gorgeous coconut cake type thing with mango and passion fruit with basil sorbet which was not to my taste so left the sorbet on the plate. Unfortunately due to safety reasons they could not use the bday cake we had bought or the candles which is understandable as they were sparklers and we hadn't informed them before. But they put a candle in the dessert for my friend anyway at request. Started to get busier around 7 pm but we were not rushed and actually stayed past 8pm maybe as they did didn't have a booking following us. Bill for four people came to £250 so not cheap and included 3 cocktails as only one person drinks so £250 didn't include a lot of alcohol. Overall would def go back for a special occasion due to the price but really enjoyed the food surprisingly and the views. Waiters took photos of us and spent time attending to our questions about menu.